The attribution of engravings is often a very difficult matter in the absence of definitive biographical evidence. It is especially difficult in an area such as that represented by Blake’s commercial engravings, in which the engraver is often following another man’s designs, and in which a personal style tends to be submerged in conventions that are not particular to any one individual. An experienced eye and mind may be able to look at a print and arrive at a correct attribution, but such an intuitive solution may be difficult to support in debate without the evidence of some identifiable minute particulars. This brief essay is an attempt to provide a few such particulars in support of a conclusion arrived at, it would seem, by an intuitive process honed by long and committed experience. Some years ago the six plates signed “Blake” in the three volumes of The Seaman’s Recorder were claimed for William Blake in an article written by G. E. Bentley, Jr., though with an acknowledgement that they were “the merest journeyman work.”1↤ 1 G. E. Bentley, Jr., “Byron, Shelley, Wordsworth, Blake, and The Seaman’s Recorder,” SiR, 9 (1970), 21-36. Bentley gives full bibliographical details of the volumes, together with reproductions of all of the plates in question. 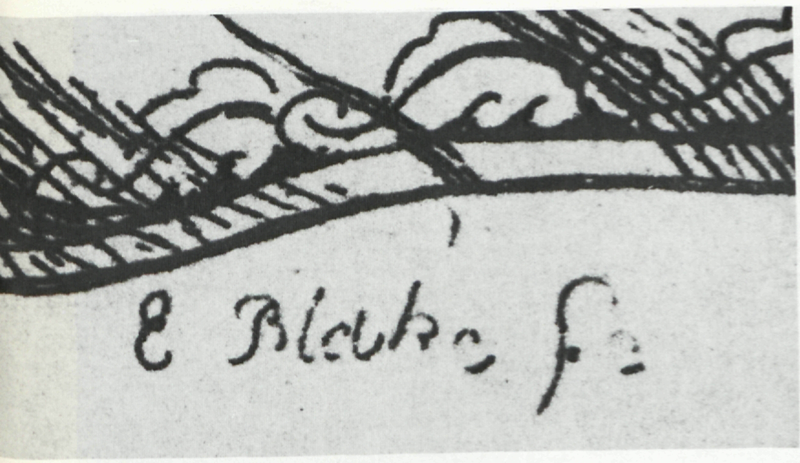 This drew a reply from Geoffrey Keynes, who argued that the “plain incompetence” of the etchings made it impossible to attribute them to William Blake, the signatures notwithstanding.2↤ 2 Geoffrey Keynes, “Blake’s Engravings for Gay’s Fables,” Book Collector, 21 (1972), 59-64. Bentley, in his recent Blake Books, still regards the plates as William Blake’s, but adds the comment that Keynes’s case “will be stronger when there is clear evidence that another engraver named Blake was signing plates in the 1820s.”3↤ 3 G. E. Bentley, Jr., Blake Books (Oxford: Clarendon, 1977), pp. 613-14. Such evidence exists, and not too surprisingly is to be found in the Print Room of the British Museum. There, the only item in a folder marked, and catalogued, “E. Blake?” is a proof (BM 1920-9-30-1) of the plate “Lord Byron in a Storm” from The Seaman’s Recorder. The cataloguer has obviously not identified the print as deriving from this work, but has added a note (referring to A. G. B. Russell’s The Engravings of William Blake) which associates the print, quite correctly in my view, with the E. Blake who etched some of the plates for W. West’s Theatrical Characters, of which the British Museum Print Room has a large collection. 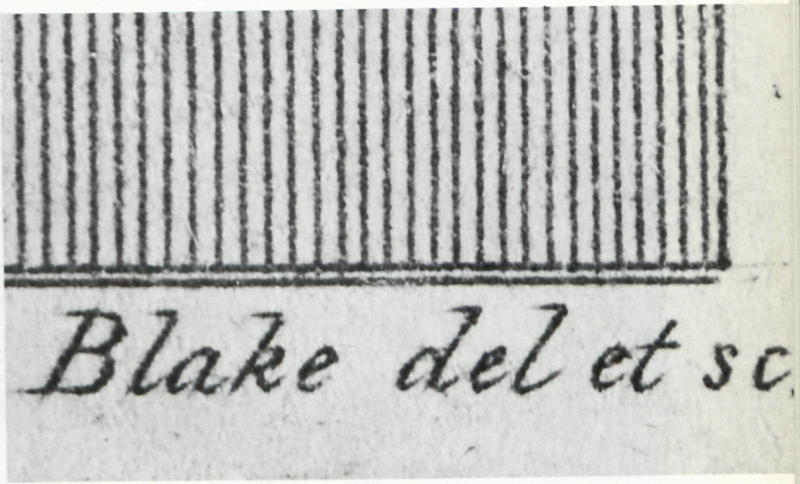 A comparison of the signature of the Lord Byron plate (illus. 1) with the signature of the E. Blake who etched some of the Theatrical Characters plates shows a close resemblance in style and form. 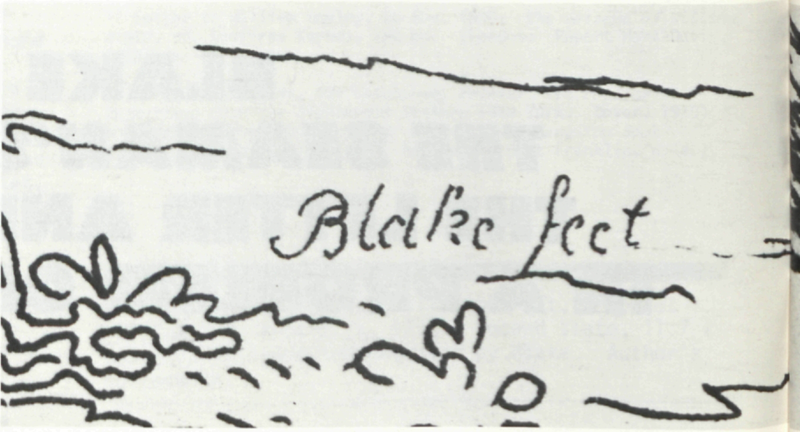 Two of these signatures are reproduced here, one reading “Blake fect” (illus. 2)4↤ 4 This signature is taken from Vol. 2, No. 166, “Mr. H. Kemble, as Massaniello, In the Fisherman of Naples. London, Published March 17, 1825, by W. West, at his Theatrical Print Warehouse, 57, Wych Street. Opposite Olympic Theatre Strand.” and the other “E. Blake fc [Sc? ]” (illus. 3);5↤ 5 This is from Vol. 2, No. 136, “Mr. Huntley, as Bagzed. London, Published March 6, 1825, by W. West, etc.” the signatures resemble each other quite closely, and there is another plate signed “E. Blake fect” to act as a mediator between the two forms illustrated.6↤ 6 Vol. 2, No. 208, “Mr. O Smith—as Malvolex. London, Published May 18, 1827, by W. West, etc.” It is apparent that these two signatures are very close indeed to the signature on the Lord Byron plate. The dates are also entirely compatible; the Seaman’s Recorder volumes are dated 1824-1825, while the Theatrical Characters plates from which illustrations 2 and 3 are taken are both dated 1825. I think it is clear that the same E. Blake was responsible for all of these plates. The standard dictionaries of artists and engravers do not mention an E. Blake, and neither does Keynes or Bentley, who have both written about Blakes other than the William Blake who was both poet and painter.7↤ 7 Geoffrey Keynes, “Engravers Called Blake,” in Blake Studies, 2nd ed. (Oxford: Clarendon Press, 1971), pp. 46-49; and G. E. Bentley, Jr., “A Collection of Prosaic William Blakes,” N & Q, 210 [N. S. 12] (1965), 172-78. As the title indicates, E. Blake is not relevant to this latter essay. He was mentioned very briefly a few times late in the nineteenth century,8↤ 8 William Archer has a sensible note which casts doubt on previous enthusiastic claims for William Blake’s hand in the Theatrical Characters prints, “The Drama in Pasteboard,” The Art Journal, N. S. 7 (1887), 105-08, 141-44. but A. G. B. Russell seems to be the last writer on Blake to refer to him, in dismissing the Theatrical Characters prints from the canon of William Blake.9↤ 9 A. G. B. Russell, The Engravings of William Blake (London: Grant Richards, 1912), p. 199. 1 Signature on plate of “Lord Byron in a Storm,” The Seaman’s Recorder, Vol. 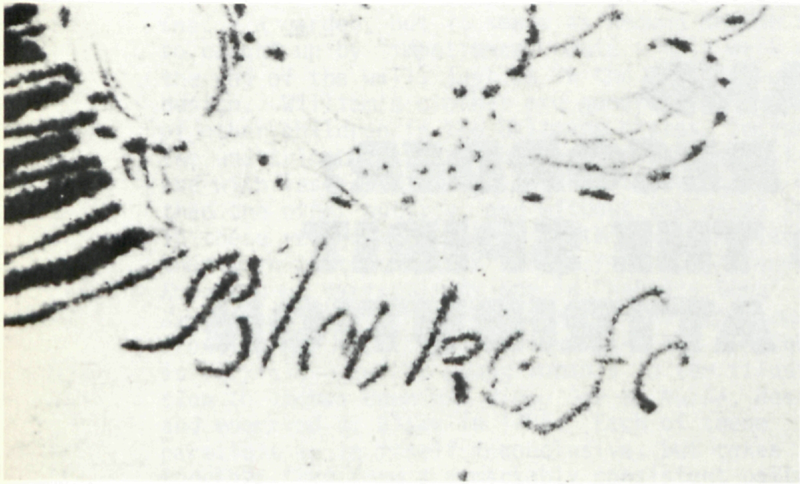 II, p. 1.
and of the more formal signatures on the other plates signed “Blake” from The Seaman’s Recorder, which all follow the pattern of the signature (illus. 4) to the plate representing Flaxman’s monument to Nelson, which is the frontispiece to Vol. II, Bentley’s Plate No. 2. 2 Signature on plate of “Mr.. H. Kemble, as Massaniello,” West’s Theatrical Characters. 3 Signature on plate of “Mr.. Huntley, as Bagzed,” West’s Theatrical Characters. A perhaps less significant difference is that the signatures in The Seaman’s Recorder have a rather more pronounced backwards sweeping head on the “l” and “k” than do the corresponding strokes on William Blake’s signatures. 4 Signature on plate of Nelson’s monument, frontispiece to The Seaman’s Recorder, Vol. II. small-scale bibliographic tool which may possibly have further uses. In this instance, a technique—developed by Erdman with the assistance of Bentley—of using the evidence provided by Blake’s script can be used to confirm the intuition of Keynes. Here, at least, the letter and the spirit are in concord. 5 Signature on plate 21 of Vol. III of The Anti-quities of Athens, 1791. Bottom of page 16.